What It Is: I don’t know what it is, but it feels like designer Kate Spade is having something of a moment – as of late, I see her pieces everywhere, including a new partnership with Indigo. The store now carries a full line of accessories, party decor and paper products all bedecked with Kate Spade’s trademark mod minimalism; from printed totes and sleek journals to printed straws and bold-coloured coasters, there are literally dozens of little trinkets that would make wonderful gifts and stocking stuffers this holiday season. I’ve definitely got my eye on that cute translucent umbrella pictured above! Who It’s For: Your sis that loves Kate Spade the brand but hasn’t been able to splurge on a designer piece just yet – let this be a gateway. Your coworker, as a fun going away or birthday gift that won’t break the bank. The hostess of your first holiday shindig, because what girl wouldn’t flip for glitter coasters? What It Costs: $10+ (I don’t believe any items are over the $40 mark). Where It’s At: Indigo stores and online. Want a bonus entry into this week’s Fig + Yarrow giveaway? Leave a link back to your favourite product from the Kate Spade line and tell me why it’s tops! I like this coaster set. 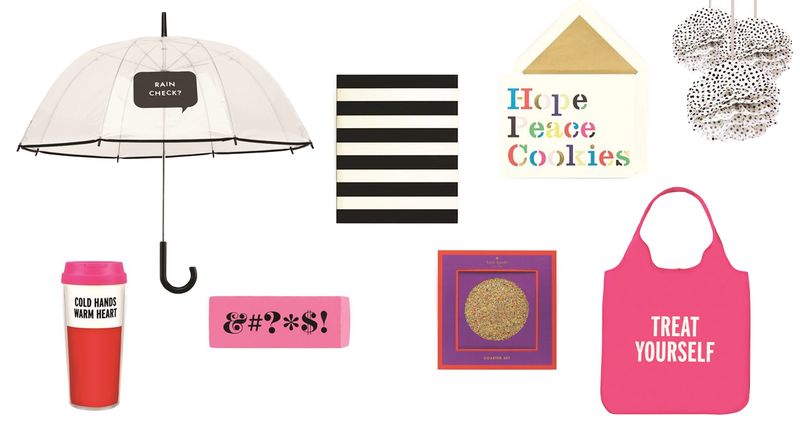 http://www.chapters.indigo.ca/style/rain-check-umbrella/825466923294-item.html?ref=shop%3apaper%3akate-spade-gifts%3akate-spade-gifts%3a2%3a This is tops because it would make me smile every time I used it and I think it would make others smile also because it’s fun. reversible gift wrap, mainly because I love polka dots & love wrapping gifts,plus this wrap could be used any time of the year. My favourite product from the Kate Spade line is the Rotating Stamp and Pad because I think it would be fun to stamp some of those sayings on paperwork! I like the Kate Spade 3 Piece Sticky Pads because of the colour combo. Bonus Fig+Yarrow entry: my favourite product from the Kate Spade line is her, “Bow Push Pins- Set of 24” http://www.chapters.indigo.ca/paper/bow-push-pins-set-of/825466923164-item.html?ref=shop%3apaper%3akate-spade-desktop%3akate-spade-desktop%3a14%3a. It’s tops on my list ‘cos my bulletin board could do with some class 😉 Would go great with her “Bow Paper Clips- Set of 12”.